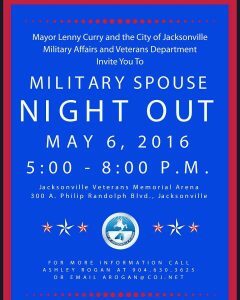 Mayor Lenny Curry and the City of Jacksonville Military Affairs and Veterans Department will host a Military Spouse Night Out on May 6, 2016, 5-8 pm at Veteran’s Memorial Arena in Jacksonville, FL. The free event is designed to honor female and male military spouses and enable them to enjoy an evening of pampering, self-defense demos, fitness demos and cooking demos. The local chapter of the USO will be providing more than 800 Ann Taylor dresses for female spouses. All they need to do is show a valid military spouse ID card and then they can choose a dress in their size and preferred color—the garment will be theirs to keep. The hosts envision this event as a small ‘thank you’ for the service and sacrifices our military families make on a daily basis! This event is open to all Active Duty, Reserve, Guard and Retired spouses with valid ID. The hosts would appreciate you spreading the word to anyone you know who may be interested in attending or providing a service! Note: military spouse ID cards will be verified at the door.